PTFE as a Sealing Material - Gallagher Fluid Seals, Inc.
At first, PTFE was only used in military applications that took advantage of its extraordinary behavior. The plastic, which has very good electric insulating characteristics, was employed in coaxial cabling for radar systems. Moreover, it withstood extremely corrosive acids and thus met requirements that were important for uranium 235 production. But the material’s true triumph had civilian origins. Parisian chemist Marc Grégoire came up with the idea of coating his fishing line with the material so that it would not tangle as easily. In 1954, his wife suggested coating pans with the material. By then, it was known by its DuPont trade name Teflon™. In just a few years, the company founded by Grégoire managed to sell more than 1 million of these nonstick pots and pans. Among other applications, PTFE is used in clothing and, as Gore-Tex, forms a thin membrane that wicks away the moisture in sweat but keeps out water. PTFE is an attractive option for seals mainly due to its chemical resistance, tribological properties² and the broad temperature range of its applications. 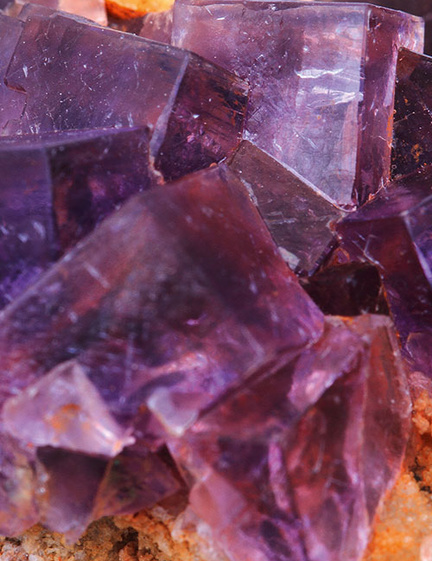 Fluorspar is used in the synthesization of tetrafluoroethylene (TFE) – the base material for the production of PTFE. It is first transformed into calcium sulfate and hydrogen fluoride with sulfuric acid and ultimately into TFE with chloroform at high temperatures. The polymerization of TFE is initiated with the help of an initiator system and other polymerization aids. Depending on the polymerization process, PTFE particles of different sizes between 200 nm and 20 mm are produced. The suspension polymerzation is first coarsely pre-ground and then finely ground for further processing using an air separation mill. Here the grain size is usually between 20 and 60 µm. The product obtained in this way is called a non-free-flowing suspension PTFE, which is expelled as a molding or base powder for the production of compounds. To improve certain characteristics, PTFE is mixed with filler or reinforcing materials in an extremely wide range of varieties and quantities. These PTFE compounds based on standard PTFE or chemically modified PTFE broaden the range of potential applications by increasing the materials’ compressive strength, heat conductivity and hardness and reducing deformation under load, wear or thermal expansion coefficients. The most usual fillers are graphite, glass fibers, bronze, carbon and carbon fibers. Since the fillers generally cannot react with the PTFE, they are first mixed with the PTFE matrix and then compressed and sintered with it . To make seals from these kinds of PTFE compounds, semi-finished goods are first produced in a variety of processes. Seals are fabricated from the semi-finished goods (e.g. tubes, rods) based on the design through the use of CNC processing machines. They then only need to be trimmed. In PTFE – as opposed to ethylene – hydrogen atoms are completely replaced by fluorine atoms. As fluorine has extremely strong electronegativity, a remarkably strong bond to carbon results. That is why PTFE is extremely media-resistant to both polar and nonpolar media. It is only non-resistant to strong reducing agents, such as solutions of alkali metals (e.g. sodium) in liquid ammonia, or to very strong oxidizing agents such as elemental fluorine at high temperatures and pressures. High energy radiation can also damage the material. Because PTFE does not react with other materials, it cannot adhere directly to another material. So sintered PTFE must be pre-treated with chemical etching. Then it can stick to other substrates. 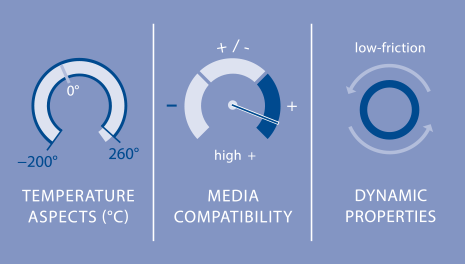 PTFE can be used in an extremely wide range of temperatures, from −200 °C to 260 °C and for short periods even up to 300 °C. It even exhibits slight flexibility at −200 °C. If it is heated to a higher temperature, it doesn’t melt – it decomposes. PTFE has high heat expansion and is hard but barely elastic. Only when PTFE is slightly stretched does it nearly return to its initial condition. At a higher elongation, a plastic, irreversible deformation occurs, even at room temperature. If the temperature is further increased, the “tendency to creep” is even more pronounced. PTFE has a very low coefficient of friction with regard to most counterfacing materials. That means the transition from standstill to motion takes place without a lurch – there is hardly ever a stick-slip effect. PTFE slides on PTFE almost as well as wet ice on wet ice. These qualities make it ideal for use in dynamic seals. Its resistance to media and a wide range of temperatures recommends it for applications at high temperatures or in contact with chemically aggressive substances. PTFE is also physiologically harmless and permitted under the regulations of the U.S. FDA, EU and the German Federal Institute for Risk Assessment (BfR]. ¹ Aqua regia is a mixture of concentrated hydrochloric acid and concentrated nitric acid in a ratio of 3 to 1 and can dissolve gold and platinum. ² Tribology is the scientific investigation of friction, lubrication and wear. This blog article is an excerpt from Freudenberg Sealing Technologies The World of Freudenberg Sealing Technologies.